In response to these acusations of page bloat, we have seen an emerging trend which is that top websites are now decreasing there page weights. For example Financial Times has stated they are moving from a “culture of addition” to a “culture of subtraction” in order to reduce page load times. Customer sastisfaction is the obvious benefit here, faster pages means people get to the content they want quicker. But there is also another motive at play; research has shown load speed costs money, some times in a big way. Not only are there costs to the provider for heavy website, but it can also cost users as mobile data plans are often expensive, especially in developing countries. 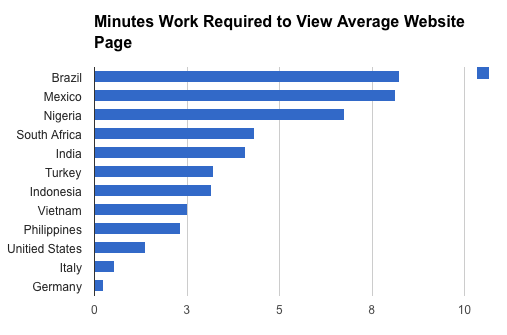 As a final thought I thought I’d leave you with two articles I found interesting regarding page weight; the first is Chris Zacharia’s eye opener post about reducing page weight at YouTube and the positive (if unexpected) effects that had. In addition there is John Allsopp’s commical post/talk ‘The Website Obiesity Crisis’ which is certainly worth a delve.